Since returning to the USA and their new home base in Austin, Texas, Bravado Gaming have not had things all their own way. The South African CS:GO squad’s crowning achievement in North America came with their ESEA Season 28 Mountain Dew League championship title just before the August player break. After the break and an abbreviated holiday in SA, the team’s first outing in the Intel Extreme Masters Chicago Closed Qualifier didn’t go well at all. They unfortunately bombed out in the second round against Blackout, losing 0 – 2. Epicenter has been held for the past two years in Russia’s capital, Moscow. It is quite a prestigious event in the CS:GO calendar with some unique touches in terms of the production and the elaborate stage setup. 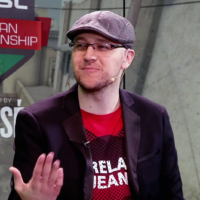 To qualify for Epicenter would be a massive coup for Bravado. They would have come into the Epicenter 2018 North America Open Qualifier with high hopes of an improved showing. This past weekend’s qualifier started off well with an easy best of one (BO1) win against minnows offBalance. Next was was a comprehensive 2 – 0 victory against Vireo Pro. Then a rather less close 0 – 2 loss to their now frequent rivals Swole Patrol. Another BO1 win over a lesser team in Arial Arise, followed by a forfeit victory over Fam143. They next moved past iNTACT in a closely-contested 2 – 1 victory to make it out of the Open Qualifier into the Closed Qualifier. Sadly, the earlier IEM result against Blackout almost repeated itself in their Closed Qualifier knockout match, finally putting them out of contention with a crushing 0 – 2 loss. 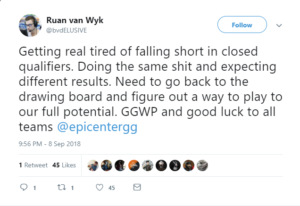 Bravado’s Ruan “Elusive” Van Wyk’s tweet after the Blackout match reveals some of the team’s mindset in the wake of the loss. South African CS:GO fans are still behind the boys in blue. We’re all looking forward to the team doing better with the defense of their ESEA MDL title coming up soon.